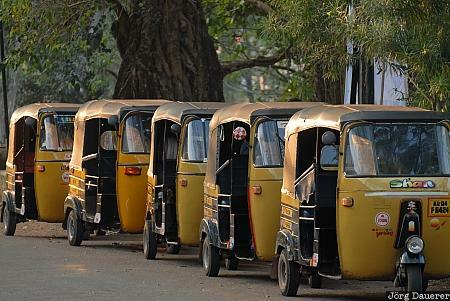 A set of Auto Rickshaws (tuk-tuks) in Alleppey illuminated by warm evening light. Alleppey is in the western part of Kerala in southern India. This photo was taken in the evening of a humid day in February of 2011. This photo was taken with a digital camera.